When I think of my Gramma Rader, the first thing that comes to mind are her open arms, kind smile and that mischievous twinkle she so often had in her eye. She always had a huge hug for her grandkids and a way with words that always made you feel like you were the thing she loved most in the world. In all the years we had together, I don’t remember any cross words, furrowed brows or I-told-you-so’s. 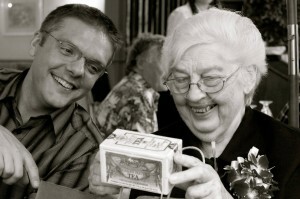 It’s possible that she was the nicest woman I’ve known. I count myself lucky that she was my Gramma. Growing up, we never lived that far away from Gramma and Grampa. That meant lunches at their place instead of going home or eating at school, Gramma teaching me how to play solitaire and other card games and countless family outings in and around Cranbrook. There are so many little stories I could share, and yet what I cherish most about each of them aren’t the details of what happened or who was there, but how Gramma always made me feel warm and special and loved in only the way that she could. And not only as a kid, even in our recent visits, a hug from Gramma somehow always felt just a bit more special than all the other hugs – like she put more into her hugs than the rest of us do.